The story Americans are wont to tell themselves about their nation is a compelling one: the United States is a force for good in the world, a haven for prosperous upward mobility, and a stalwart defender of democracy and human rights abroad. With The Racket, veteran investigative journalist Matt Kennard pulls back the curtain and reveals a much darker truth. The picture of America he paints is radically at odds with that noble image: through Kennard’s eyes we see another America, one that has lashed the world to a neoliberal vision and has rewarded wealthy elites at the expense of ordinary people, genuine freedom, and the global environment. Building his case from more than 2,000 interviews with officials, intellectuals, and artists around the world, Kennard reveals how we are sold a dream and how that dream obscures the reality of the corporate state, mass incarceration, and the evisceration of human rights. "In this important book, Kennard explores the direct impacts of militarized, globalized American capitalism on some of the most battered parts of our world. With devastating precision and a formidable sense of urgency, he reports on corporate shock doctors in Haiti, imperialist drug warriors in Honduras, pillaging coal and mining giants in southern Africa and Appalachia -- and so much more. Most importantly, he never loses sight of the growing numbers of resistors holding on to their creativity and self-determination in the face of these forces." "Matt Kennard's perceptive direct reporting and analysis of policy aim to expose 'the racket' that dominates much of global society and to 'blow their cover'. His in-depth studies, ranging from Haiti to Palestine to Bolivia to Honduras to the destitute in New York City and far more, bring home in vivid and illuminating detail the reality of life and struggles of much of the world's population, their defeats and victories, their suffering and vitality and hope." 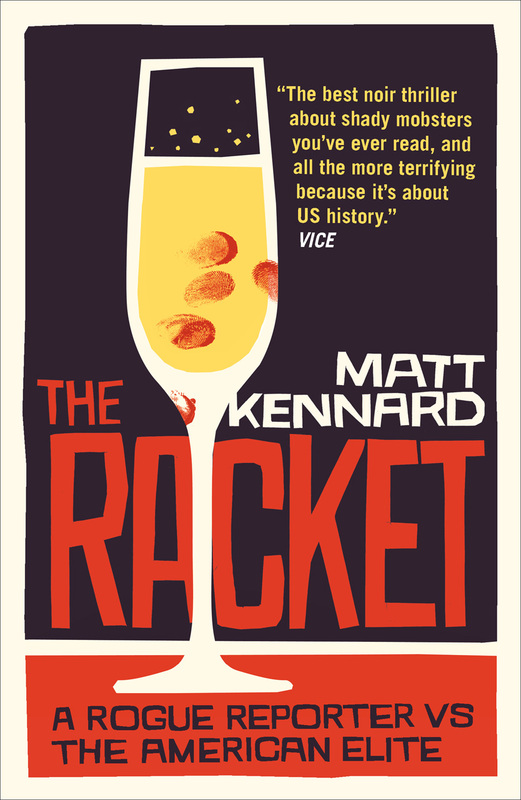 "Matt Kennard's The Racket is a powerful tool for self-education: it offers essential information about the insatiable and sordid nature of global, elitist, exploitive, profit-blinded governments and institutions that have, together, perfected the task of making billions of people miserable, poor and fatally unhappy. It also offers testimony from activists and artists who are not giving in, giving up, or lying down." "Matt Kennard threw away a cushy career with an establishment newspaper just to let you in on a secret: you don't get the story, you get the cover-up. From Honduras to Haiti to Washington to London, Kennard lets us in on the details of buried truth." "A crucial exposé of the powerful, of injustice, and of the war against the poor. It should inspire all of us to fight back." "A brilliant atlas of what Kennard calls 'heavy history' - the hurricane-like path of global destruction wrought by neoliberalism and wars against the poor." "This firecracker of a book, written by a former insider journalist who realised the true, exploitative agenda of corporate media, unleashes a gonzo journey across the world of US empire. From Palestine to Bolivia and America to South Africa, reporter Matt Kennard provides a roadmap of deformed economics, state violence and inspiring resistance. The Racket's key message is that another, more just world is possible when political and media courtiers of power recognise their own complicity in Washington's destructive policies in the name of 'development', 'humanitarian intervention' and 'liberation'. Read this book, be startled and then take action." "Matt Kennard reveals the ruthless criminal dynamics of global imperialism. His analysis is richly researched, keenly illustrative, and consistently on target. May this book get the wide readership it deserves." "I congratulate Matt Kennard for this brutally honest work. We need Kennard other writers like him who have the courage and creative mind to expose the lies and deception of the Free Market, Free Elections, Free Choices, Democracy, Peace, Cooperation, Friendship, Partnership, Equality, Justice and other beautiful words hiding savage brutality, violence, terrorism, colonialism, and imperialism." "The Racket is tough, angry, relentlessly researched and riveting, in the grand Chomskyian tradition but with the added value of the journalist's mobility and on the spot coverage. Kennard's range is wide, both geographically and topically, but with a single target-the depredations of the US superpower's corporate and political elites on their own home turf and abroad that the lap-dog media rarely touch."